During the 19th century there was a marked increase in the popularity of the Temperance Movement. This group promoted a lifestyle of abstinence and moderation, encouraging men to turn away from alcohol, which they saw as the root of their societies problems of poverty and destitution, and instead to save their money for their future. 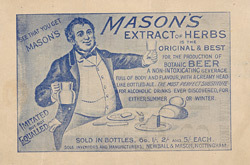 Beverages such as ‘Newball & Mason’s non alcoholic beer’, were promoted as healthy alternatives to beer or spirits.